All you loyal sons of Erin, I hope you’ll draw near for the rights and the wrongs of our country to hear. In the days that are past, when they drove us away from our dear home in Ireland, far over the sea. when her husband refused the rent to pay down and evicted we were, from sweet Ballygowan. Oh hurrah for our banner, it’s waving there still. Well guarded by Abbey and sweet Abbeyville. On the day of the evictions, some thousands were there to conquer the tyrants, each man did prepare. When the officer’s bugle gave a loud shrill for to make an attack on Thomas Finn’s mill. The Orange advanced for to break in the door, to take down the green flag representing our shore. We poured boiling water on the Orangemen down. 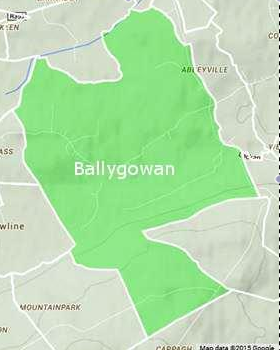 They’ll remember the day when they saw Ballygowan. When the crew from the North was dejected they said, they wired for the Army to come to their aid. The soldiers obeyed at the word of command and they marched in by Abbey to take up our land. who fought for his country, his life he laid down for to conquer the Lewis’s and Sweet Ballygowan. John Burke and Mike Murray were evicted that day, likewise Pat McDonagh now cold in the clay. Our brave Thady Meara whose might did not fail and our hero John Kelly was sent off to jail. Old Patsy Burke, now he gave great abuse to the rack-renting tyrant they called Harry Lewis. John Minogue, James Guerin, their farms were laid down for to close the evictions of Sweet Ballygowan. But now there’s great changes over there I can see, by a letter that came o’er the water to me. As I read through the lines, it appears to be plain that we soon will be home in our farms once again. The houses are building, I’m told they are grand, all waiting for me in my own native land. So we’ll hoist the green banner and the Shamrock we’ll drown and sing the bright praises of Sweet Ballygowan. I am trying to find out if Thomas Finn mentioned in the song had siblings of Mary Ann, Bedelia, John White, Joseph and Kate Finn. These siblings migrated to Australia. My brother-in-law’s great grandfather was John White Finn.